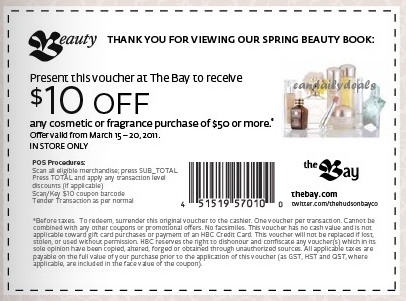 Spend $50 or more on cosmetics or fragrances at The Bay, between March 15-20, 2011, and receive $10 off with this printable coupon. Some restrictions apply. This is a great coupon because The Bay has a large selection of cosmetic and fragrance name brands such as MAC, Clinique, Lancome, Estee Lauder, Shiseido and many others. Click here to print the $10 off coupon.